Amazon may have entered the Australian smart speaker market a little late but the e-commerce giant is doing everything it can to make home automation simple and affordable for Aussie users. The Echo range of smart speakers are some of the most affordable options available to anyone looking for a new voice-activated audio system, but what if you already have a Bluetooth speaker you love or a home Hi-Fi system set up? That’s where the Amazon Echo Input comes in. It's a small (80mm across and 14mm tall) web-connected device designed to pair with your old-school stereo via either Bluetooth or a 3.5 mm audio cable. Once connected, you can call on Alexa to do everything an Echo speaker can straight from your existing ‘dumb’ speaker. 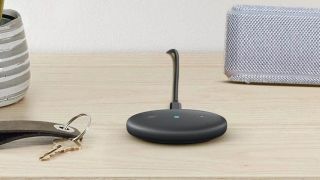 Your old speaker doesn’t even need in-built microphones to hear your voice commands – the Echo Input is equipped with a four-microphone array, so you can call on Alexa from across the room. There’s also dual band (2.4 and 5GHz) Wi-Fi to maintain a consistent connection, and Amazon has been steadily improving Alexa’s skills in Australia. What makes the Echo Input an enticing choice is its affordability. Priced at just $55, it’s good value for money if you already have a great sounding speaker or home cinema receiver. The only caveat is that it currently doesn’t support Sonos speakers.